I like making things to celebrate an event, particularly births and weddings. 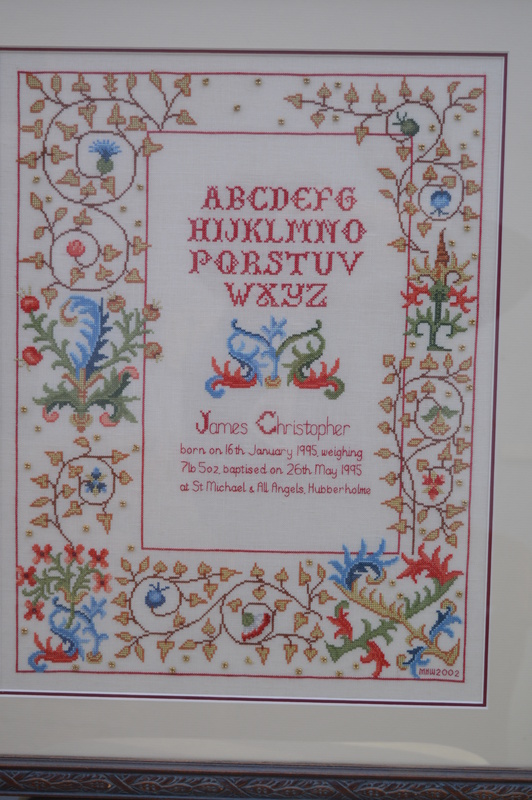 The first birth sampler I made was for my niece, it was a cross-stitch of the Beatrix Potter frontispiece with the details in the middle, very pretty and sweet. By the time I came to stitching one for my friends children, I decided I would prefer to make a sampler that would still appeal when they grew up, I started looking at designs where I could take a band or two out to insert the birth details. The other advantage of this was that I could include whatever details I wanted, such as the christening date. You can see the two samplers here. When James was born in 1995 it took me some time to find a design that I thought would appeal to a male, there’s so many flowery ones out there! 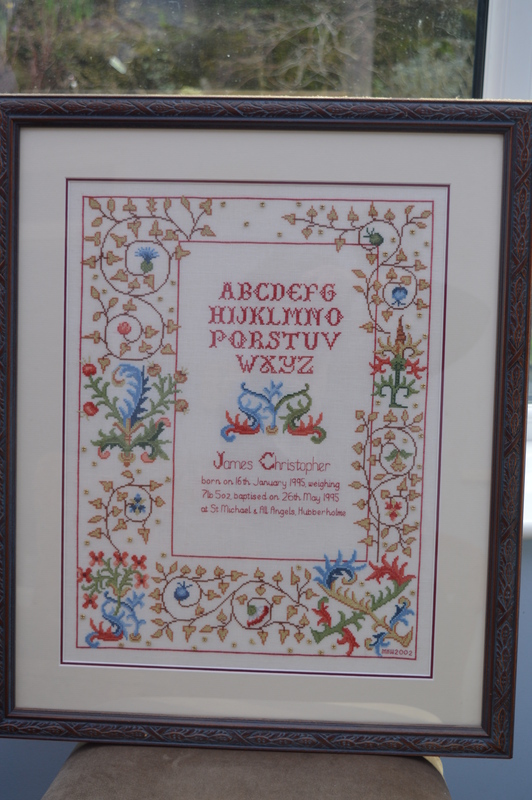 I finally found a design which I think was printed by DMC, it was illuminated calligraphy from a book at the Bodleian Library in Oxford. It was perfect, the original design had a second alphabet underneath, I simply substituted in his details instead. It’s a beautiful sampler, the leaves are in gold thread, there are tiny red beads in the border, I love it and more importantly my 20 year old son still likes it! It took quite a while to stitch, the gold thread was not easy to use, the eagle eyed amongst you will have noticed he was 7 years old before it was completed! Helen was born 2 years later, I knew exactly which design I wanted to use! A few years before I was given a book called Home Sweet Home by The Vanessa Ann Collection, inside was a really pretty sampler. I had stitched it before for a friends wedding. It’s in lovely shades of blue and purple, with lots of Mill Hill glass beads to add extra detail. 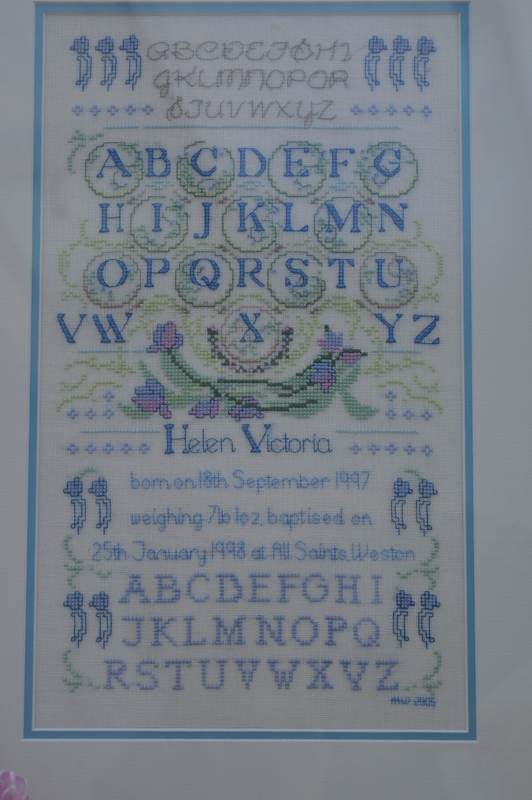 I decided to include the whole design this time, just make it longer by adding Helen’s birth and christening information. If I was stitching it again, I would probably leave out the lower alphabet as I think the proportions would be better, but I still think it’s beautiful. Eight years ago this week Ken and I got married, it was very much a handmade wedding. We had a wonderful day and afterwards I wanted to make a sampler to celebrate the joining of our two families. 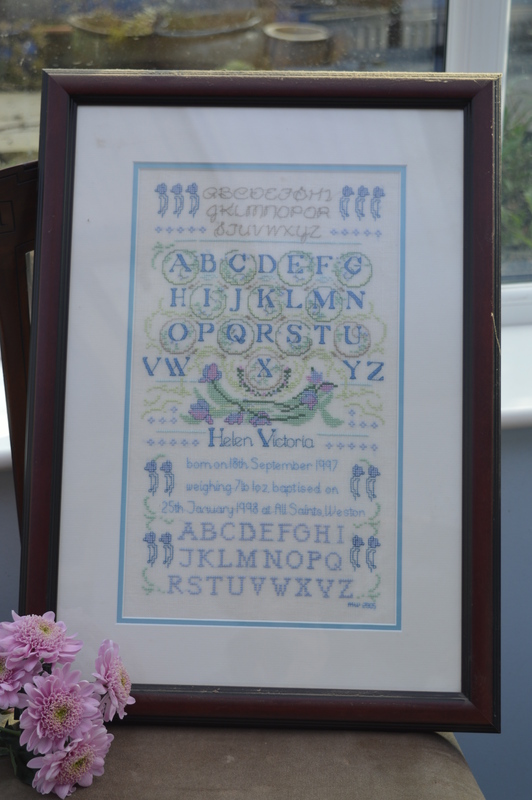 I had often admired the family word art pictures you get on sites such as Not on the High Street, so I decided to work out a cross-stitch one! I included things we like to do, where everyone was born, birthdays, wedding details. I interspersed it with phrases and words that are important within our family. I wrote out each phrase on graph-paper, cut them up and sat and played with the shapes until I had a design that worked. Having chosen three shades of grey floss to embroider the words, I decided to use red for the word ‘love’ every time it was used, it just lifted the design. It hangs above our fireplace in the lounge where we have a red feature wall, it looks great! What do you make to celebrate a special event? 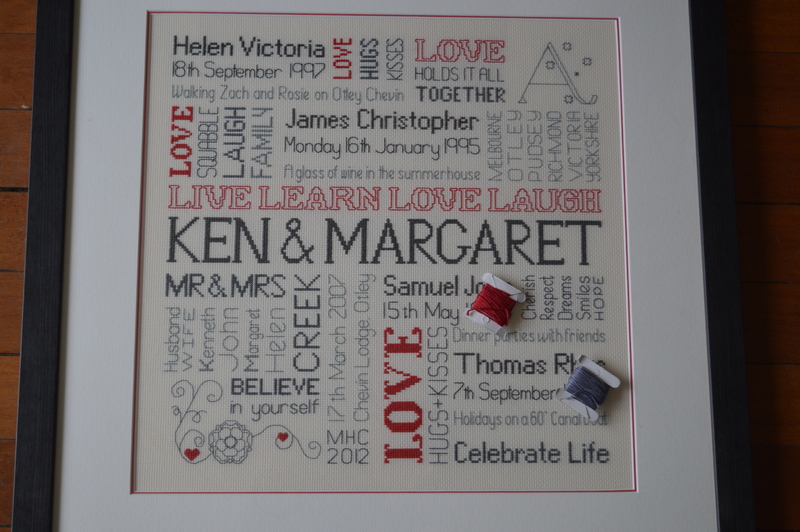 This entry was posted in Crafts, Sewing, Wedding and tagged birth sampler, cross-stitch, wedding. Bookmark the permalink. Thank you, and thank you for organising the Meet and Greet! Your stitching is beautiful! What great pieces to celebrate special times in your life! Thank you Linda, I love them too! Fantastic stitching! I love the pieces! Thanks Anita, I enjoyed stitching them too! Your stitching is so pretty. I love the stitching about your family, beautiful. Thanks Mary, it took a while to work the design out!! The birth samplers are amazing — so personal and so much detail. Lovely blog too. Thank you Cathy, I love stitching samplers! Wow, they are great! Wish I could do that. I am not good at embroder work. I do try though. What I make for special occasions. …I guess it would depend on the occasion. 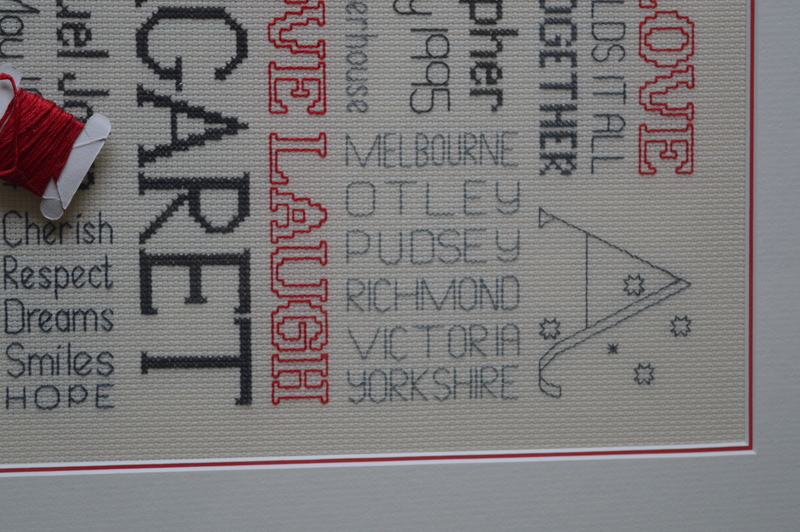 I have also made cross-stitch projects to celebrate births, weddings, anniversaries and graduations. Recently I have been designing my own when I can’t find exactly what I want. Your samplers are beautiful. Thanks Cathie, I usually adapt patterns rather than design my own, the family one was a first for me! Wow! 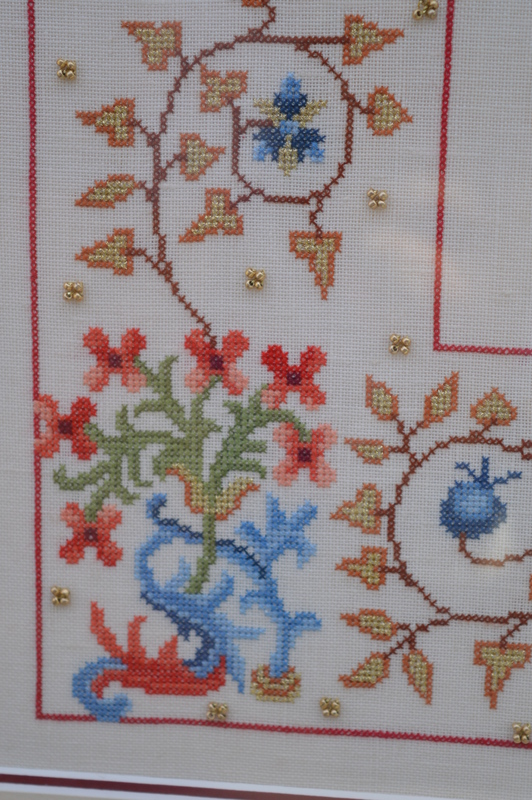 Your cross stitch is amazing- love all the projects you have shown on this blog post, especially the sampler you designed when you married.- very clever and a gorgeous memento. I love your samplers! And the way you design them…not in the computer programm, but by hands, with cutting and playing the shapes is brilliant! Thank you Maria, it would probably been easier on the computer if you have the know-how, but for someone with a blog, I’m not very computer savy! I love the black and red one! sorry I am late for my visit at your “Meet & Greet” post in by the virtue of internet-line problems at home (at some blogs, my cellphone internet did not work well). Nevertheless I enjoy it today to see your wonderful samplers. As I am a sampler lover I really admire your works. Especially the wedding sampler you designed is amazing. Have a nice first week of Spring.